From seed to sprout to plant, this is the story of how beans grow and survive to adult “bean-hood”. But staked tight, stands right. But rabbit could grab it. I love the way that each page starts with the last line from the previous page. Beyond the Book: The girl in this story planted scarlet runner pole beans. There are many kinds of pole beans - I plant rattlesnake beans. Look through a seed catalog for interesting or unusual bean names. Bean seeds are beautiful - some are speckled, some splattered like a"paint" pony, and some look like penguins. Cut out pictures of bean seeds and make a collage. OR use bean seeds and other seeds to make art. Watch seeds sprout. Put different kinds of seeds on a damp paper towel. Slide that into a plastic bag (a gallon ziplock is perfect) and watch them begin to sprout and grow roots. Look at them with a magnifying lens - and draw what you see. Grow a Book Nook – a shady place to read or nap in the heat of summer. You can grow one by making a tipi trellis of long poles. Plant pole bean seeds around the base of the tipi. As they grow, help them “find” your tipi frame. 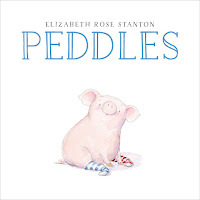 Today we're joining PPBF (perfect picture book Friday), an event in which bloggers share great picture books at Susanna Leonard Hill'ssite. She keeps an ever-growing list of Perfect Picture Books. Review copy provided by the publisher. Whose Hands are These? and Author Interview! Opening: Hands can wiggle, hands can clap. ...to help around your house? Can you wash vegetables or sweep a floor? Sort silverware? Fold socks? Do something to help the people you live with. ... to help the earth? Could you turn out the lights when you leave a room, or ride your bike instead of asking for a ride? Here are some things kids are doing to help the planet. ... to help other people? Maybe you can wash a neighbor's car or mow their lawn. Maybe you can make sandwiches for homeless people or help another kid at school with homework. Think of something you can do, and make a plan. Miranda Paul helped me by answering Three Questions! Sally: What inspired this book? Miranda: I got the idea because I'd been talking a lot at the time about all the different jobs I'd done (note: Miranda has worked in a zoo, at a store, as a teacher, and now a writer). Originally I called the manuscript "Helping Hands". My husband is one of those people who can fix just about anything, and I think it's amazing what hands can do. Sally: How did you decide whose hands to include in the story? Miranda: They had to be ones that I could rhyme with! I wrote a few extras that didn't make it into the book (and I'll be sharing those top-secret ones with schools that I visit!). Sally: I love that you have more information at the back of the book. Talk about why you included "back matter". Miranda: I love back matter—because the book doesn't end so fast! I also love back matter because I'm a lifelong learner. I included back matter in Whose Hands Are These? for a number of reasons. The publisher, Millbrook Press (Lerner), sells heavily to school and library markets. 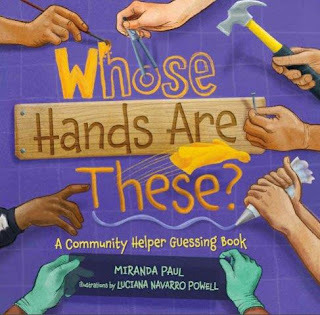 I consider the book a tool for teachers and librarians and wanted to make it the best tool it could be for a unit on community helpers. Since each occupation gets only one spread of spot illustrations (hands) and a half-spread in a single setting, it was important to explain the diversity and range within each job. An example is farmers—who are depicted on a small family farm in the illustration, but many farms today are large-scale and work with heavy machinery and I wanted to speak to that. In fact, as the back matter points out, "There are more than 200 farm-related careers, including fishing, selling, or delivering farm products, and managing parks and forests." When I tell kids some of the steps to becoming a writer, they're fascinated. And yet, many jobs have even more interesting pathways! I tried to include some of the steps or education needed to become each kind of community helper. I even learned through the process that many referees have to pass a test on the rules of their game before they can work at a professional level. In the author's note, I share a thought with kids that it's OK if they don't know what they want to be, and that it's all right to be more than one thing. There's no need for them to have anxiety about not knowing what they want to do, or switching their mind. People can be community helpers in more than one way. You can find out more about Miranda at her website, where she has a trailer for Whose Hands Are These? Last summer I reviewed her book Water is Water. You can read that review here. 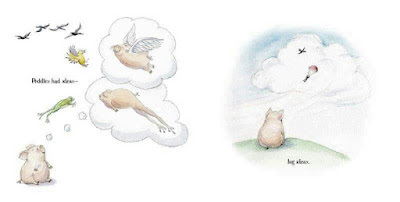 Today is PPBF (perfect picture book Friday) over at Susanna Leonard Hill's site. She keeps an ever-growing list of Perfect Picture Books. On Monday we'll join the folks over at Nonfiction Monday. Review copy from the author. ... but when other pigs are slurping down slops, Peddles is wishing for pizza. He dreams of wings, of having long hoppy legs. But nothing ever happens. Until... one night he hears a fiddle and the clonking of boots on the barn floor. If a cat can play the fiddle, if a cow can jump over the moon ... why can't Peddles dance? All he needs is a pair of boots and a plan! What I like about this book: Like another pig in a book-universe far, far away, Peddles is "some pig". He's the outsider with wild ideas. But even when his ideas are crazy - and a bit wobbly - his friends support him. I also like the red boots, the crazy socks, the notion that pigs could fly... and the wonderful illustrations. Do you have any dreams of what you'd like to do? If so, find a pair of boots and make a plan. Draw a picture of you flying or sailing or writing books - or wherever those boots might take you. Dance! All you need to do is turn on some music and move your legs. 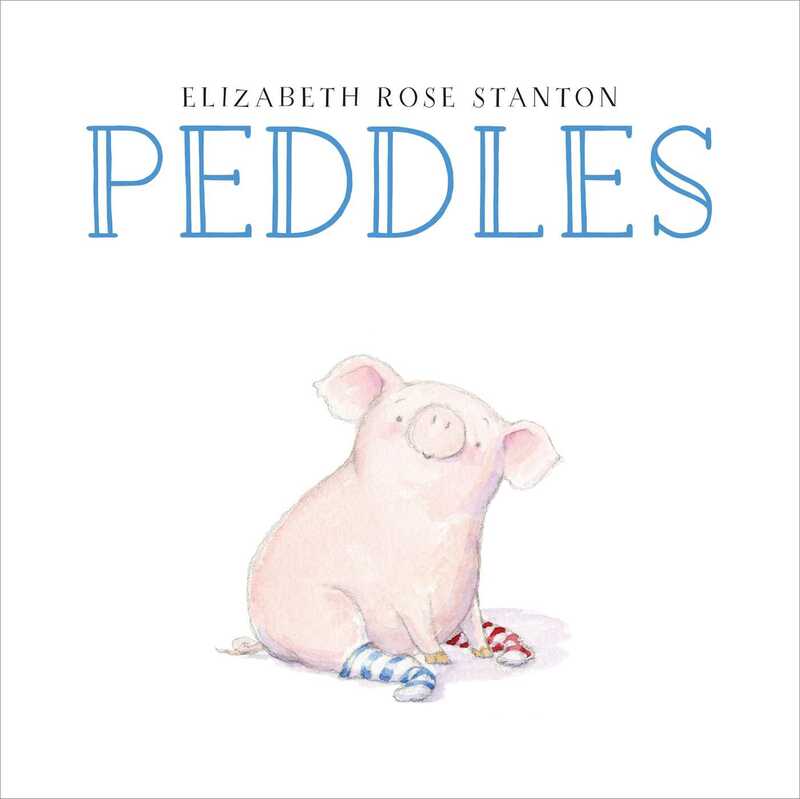 Create a dance for Peddles and his pig pals. Get to know a pig. There are many breeds of pigs, and maybe you can find some to visit near you. Maybe your zoo has some, or a local farm has some. If not, you can check out different kinds of pigs here and some miniature pigs here. Think about an unusual animal you might know... and then add a dash of imagination. A couple years ago, Elizabeth Stanton wrote about an unusual hen that had arms instead of wings. Maybe your cat or dog or guinea pig or cockatoo wants to do something grand and unexpected. What if.....? Grab a pencil or some crayons and explore that "what if". Before we dig in to today's book, a reminder: There's still time to enter for a chance to win a copy of Shmulik Paints the Town. Just leave a comment here. Today I'm chompin' at the bit to get out and do some gardening. 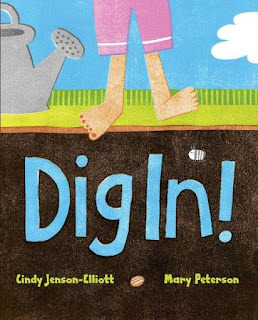 This is a perfect book for kids who love to play in the dirt. What I Like About this Book: its simplicity. In fewer than 100 words author Cindy Jenson-Elliott takes us into the world of dirt, rocks, pill bugs and spiders. And she does it in style. A very particular style. 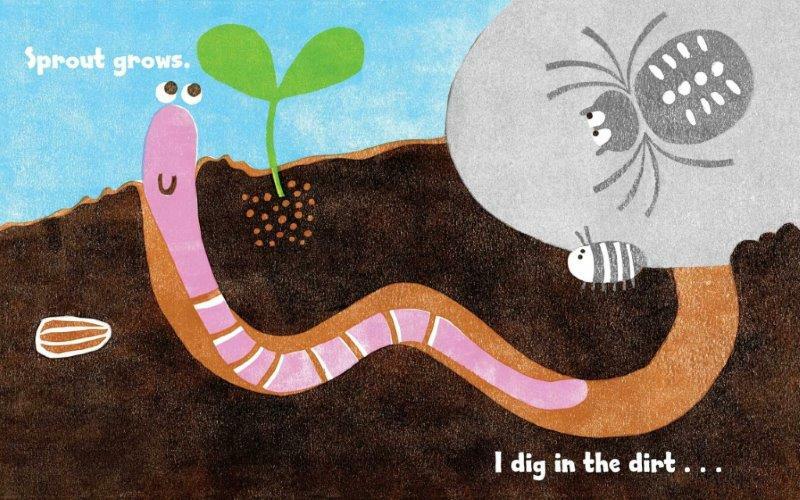 Each dirt-under-the-fingernails observation begins, "I dig in the dirt...." followed by "and find a (worm, bug, seed.....) and ending with a noun-verb combination. "Worm wiggles." Beyond the Book: get down and dirty! Get the dirt on your dirt. Scoop some onto a white plate and take a close look. Use a magnifier to get an "up close & personal" view. Do you see angular grains? Splinters of wood? Dark organic matter that clumps together? Compare the dirt in your yard to some in a forest or a roadside. Collect dirt from other places and see how they're different. Make some mud and use it to paint a picture. If you collect dirt from different areas, you might notice that there are some color variations. Some might be rust-colored, some dark brown, some greenish, some more yellow. What do you find when you "dig in"? Use your hands to dig through the top layer of soil in a garden or bare place in your yard. What do you find? A rock? A worm? A beetle? Plant roots? Draw pictures of the things you find in your dirt. This book is so fun that I just had to ask Cindy Three Questions. Which she graciously answered. 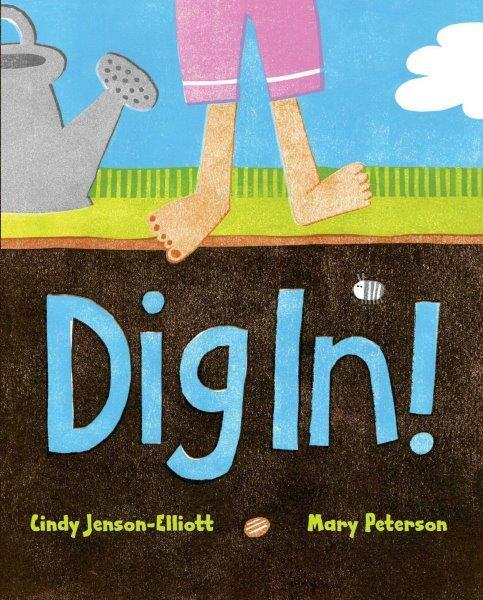 Sally: Dig In is so fun, and has so few words (about 100) - what inspired the writing? Cindy: At the time I wrote it, I was teaching reading and gardening to elementary school children. Then in February, our chapter of SCBWI held a local conference with "first page" readings. The first page could be up to 100 words long, and I thought - just for fun - that I would try to see how short I could make a complete manuscript about gardening. Could I keep it to a single page? I thought about what my youngest students loved about gardening. It was the simple things - Digging. Discovering. Celebrating. 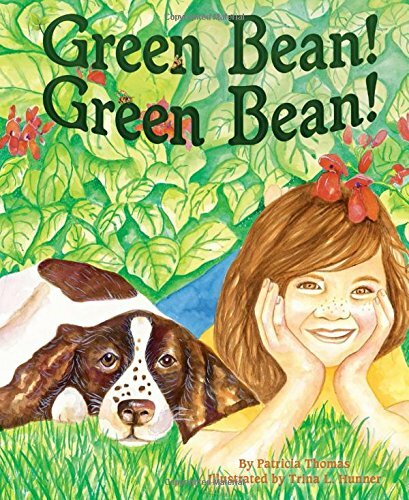 I wanted to write a book my students could read independently, one that celebrated their own experience in the garden. Sally: Most gardeners talk about "soil". Why do you like the word "dirt"? Cindy: When I write, I try to tap into my own deep love for the subject I'm writing about. My natural writing voice seems to be lyrical, and the words that come out have a lyrical quality. I like how "dig in the dirt" sounds, and I'm a dirt kind of gal. When I was a kid, I mucked around in the dirt and mud. I haven't changed much, but now it's mostly my hands that are dirty from digging around. The other thing about the word dirt is that it's small scale, personal and informal. Children experience our planet on such a small, intimate scale. I remember camping with our young children (4 months and 5 years) and after spending half an hour getting ready to hike we ended up going 100 yards up the Tuolumne River. There was so much to see in that 100 yards! Dirt is like that. There's so much to see in a square foot of soil if we get friendly with it. Sally: You always have something going on. What's next? Cindy: A biography about Ansel Adams (due out this coming September). 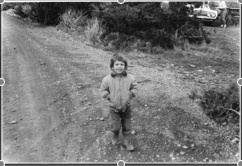 He was an "antsy" kid, until his father took him out of school and let him run around in nature. I'll talk more about him when we do that blog tour. To help celebrate Dig In! Cindy started a twitter campaign at #100HandsDigIn. She invites parents, teachers, and classes to post photos of children's hands digging in the dirt, and what they find. You can find out more about Cindy at her website. And check out this review of her previous book, Weeds Find a Way.